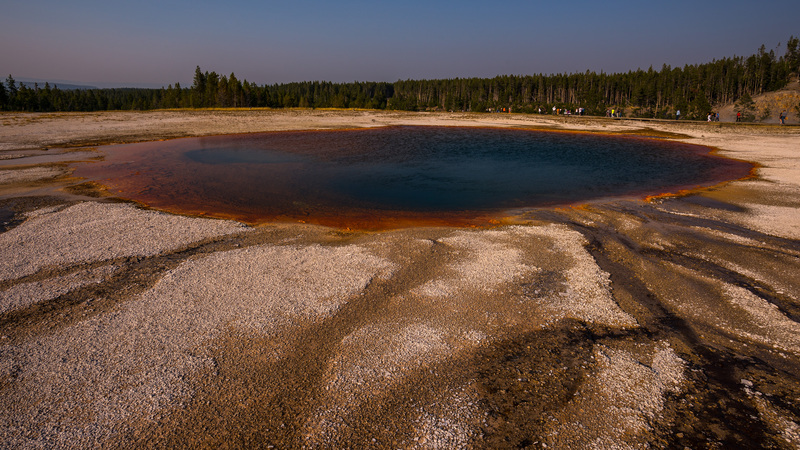 Yellowstone National Park contains one-third of the world’s geysers and one-half of the world’s thermal springs. 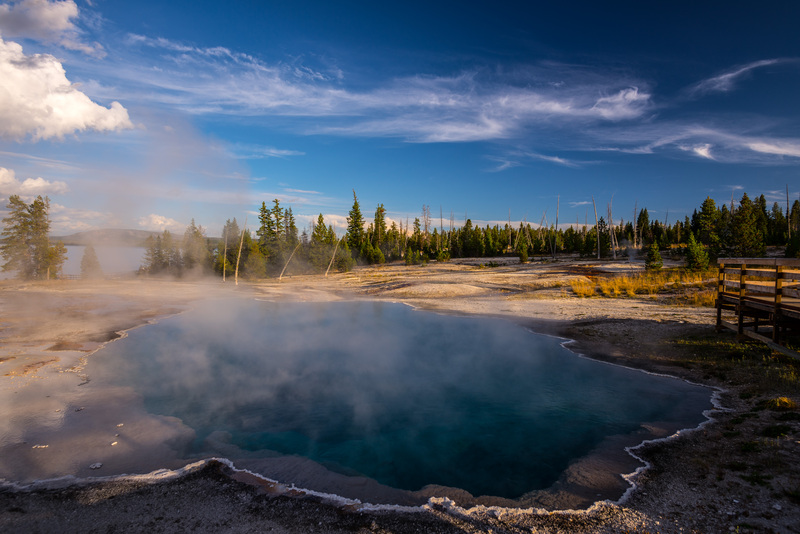 The park makes great effort to enable you to walk up to them as close as is sensible, and in most cases that means you can feel the steam and hear the bubbling. I’ve gathered just a few of the more interesting pools that we’ve passed. Some, like the Black Hole, are thermal springs that are quite hot. Others seem very complacent and simply produce cool colors. This one is very large but very calm and relatively cool. 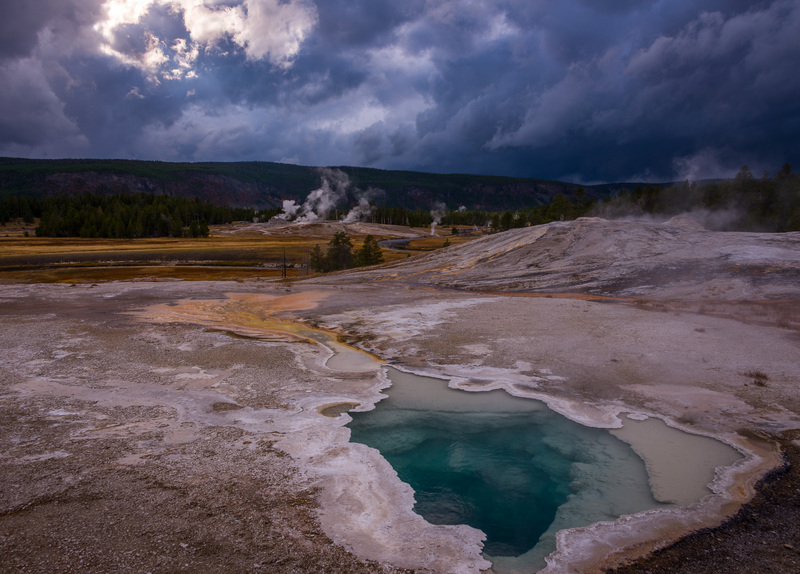 I couldn’t resist the contrast of this lovely clear blue spring with its white edging and the dark threatening skies! 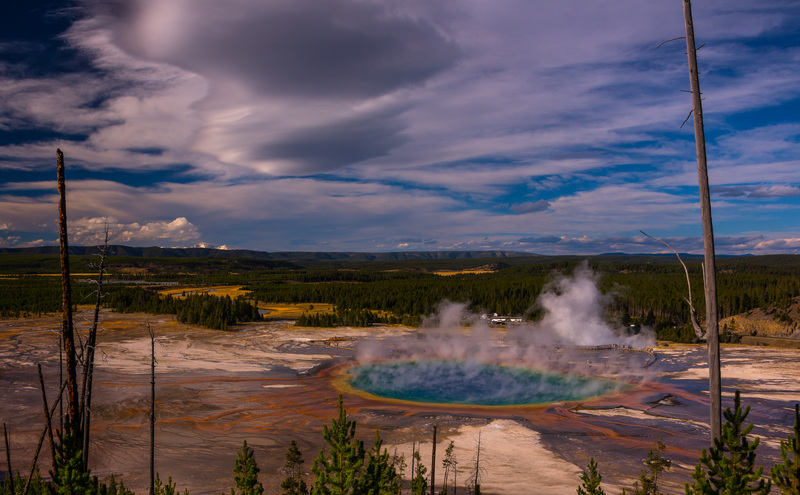 I’ve already shown you a ground-level picture of Grand Prismatic Spring, at 370 feet diameter and 121 feet deep, the largest thermal spring in the US, and third-largest in the world. Its colors match the rainbow dispersion of white light by an optical prism: red, orange, yellow, green, and blue. I was naughty and risked life, limb, and liberty to climb a small hill near it to get a clearer picture of this remarkable formation. And yes, that’s snow on the distant mountains! Be careful but keep those pictures coming! Don’t want you hurt or jailed!! Gotta do what ya gotta do…to get the picture, Trudy!